In a newly published prospective randomized double-blind clinical trial, Souza and colleagues evaluated the effects of infant formulas containing palm olein on the absorption and loss of docosahexaenoic acid (DHA, an important fatty acid for brain development) in healthy term babies.3 Researchers compared two commercially available infant formulas: a formula containing palm olein and a no palm olein formula. They found that stool excretion of DHA (loss of DHA) relative to DHA intake in the palm olein group was 17.03%, whereas excretion of DHA relative to DHA intake in the no palm olein group was significantly lower at 2.59% (or 6.57 times lower). 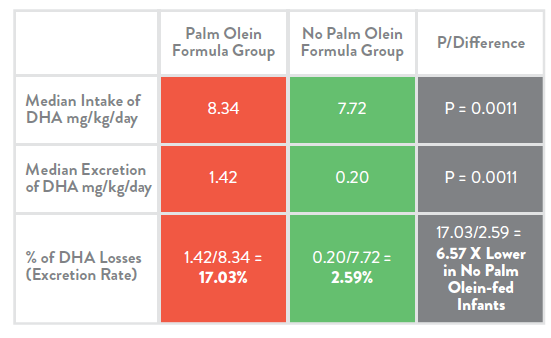 Results also showed that DHA absorption was significantly higher in the no palm olein group (p=0.038). This study demonstrated that the fat blend in infant formula makes a difference in the magnitude at which DHA is absorbed by babies. 1. Nelson SE, et al. J Am Coll Nutr. 1998;17: 327–32. 2. Koo WW, et al. J Am Coll Nutr. 2006;25:117–22. 3. Souza CO, et al. Lipids in Health and Disease. 2017;16:78.